Edited 1 time(s). Last edit at 06/28/2017 08:20PM by Rootikal. Edited 1 time(s). Last edit at 07/01/2017 05:00PM by Rootikal. Jah willing, I will be there for this one! The last show booked by this promoter at this venue was the Junior Kelly show I believe and that one was canceled without any notice. Maybe the same thing since there is been no promotion for a month? If so, not a good look. According to promoter's Facebook live post, he "believes The Gladiators are gonna be canceled." I have been informed that this cancellation @19 Broadway does not effect the shows for the Gladiators in Los Angeles and San Diego and will go on as planned. 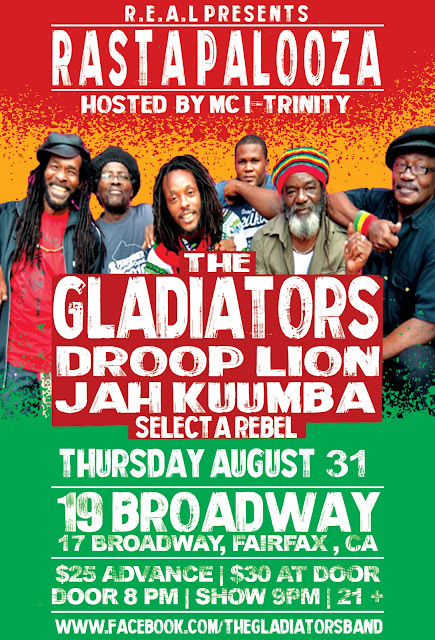 The Gladiators will NOT be performing at 19 Broadway due to issues with the promoter. I was on the phone with The Gladiators manager this morning and we are working on getting them back at 19 Broadway in the near future. My apologies for the inconvenience. We will not be using this promoter in the future. Thank you for your understanding. 19 Broadway continues to strive to be the best place in Marin County to see Reggae music.